Showing results for tags 'Bronze Age Miniatures'. I really like this sculpt from Bronze Age Miniatures, they only have him listed by his catalog number, no name. Somehow befitting a barbarian. This is my first "sculpted" base. I took a 1" sq cube and opened up the middle on one side with a jigsaw. Then further "enhanced" with a dremel rotary tool. Added cork, snow (Scene A Rama and Golden extra heavy gel) and a winter tuft (Army Painter). Not done yet, but the base is close. As for the Snowbarian, he is just waiting till I get a bit more comfortable with the brush. By that I mean until I finish my test work on other figs. I finally finished Death Dealer 1 from Bronze Age Miniatures after putting off the horse due to hating to paint black...but I think it came out well. 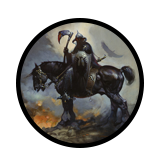 I will be working on another of these official Frazetta Death Dealers soon! I have had this Bronze Age Miniatures barbarian on the WIP shelf for far too long; its a great sculpt - very Frazetta-ish! I tried to do the skin in a paler tone, and worked more with glazes than my usual layering/blending. I used Army Painter Barbarian Flesh as the base, then glazed that with Reaper Flesh Wash a couple of times and started working back up with the Barbarian Flesh plus an old Ral Partha Noble Flesh added in for each successive glaze/layer. The hair came out a little blue but I am going to leave it and move on. As always, I love David's sculpts and he has a ton of other great barbarians I look forward to getting to. Ack ack ack! Oh wait, wrong Martians. A warband of Green Martians/Tharks from Bronze Age Miniatures. I'm not sure what I'll use them for, but they were cool and on sale. I'm not sure why they look so glossy, they're not in person. I made this barbarian from a Bronze Age Miniatures generic blank (many different poses, I love them!) after a piece of art by Simon Bisley in terms of the weapons at least. The helm is from a skull pack by Maxmini, and the skull weapons are from the Stag Lord miniature's helm (when they could be purchased from the Boneyard - wish I had more). The cloak is also from the Stag Lord. Everything else is sculpted on. I tried some different techniques, for me anyway, such as washing and glazing for the cloak and the loincloth and was happy with the results. He is probably my favorite thing I have done lately! I have not gotten much painting done this month but did finally finish this project. She was made using a Bronze Age Miniatures generic blank.